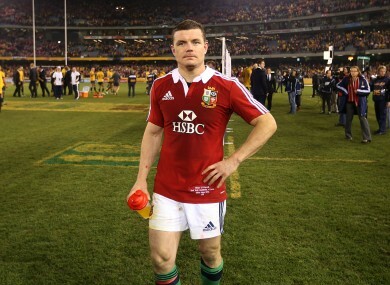 British and Irish Lions' Brian O'Driscoll was controversially omitted from Warren Gatland's selection for the 3rd Test. THERE WAS OUTRAGE of the highest order the other day, after Gatty unceremoniously dumped you-know-who ahead of the you-know-what on Saturday. The OUTRAGE bubbled and boiled at the injustice of dropping that-bloke-called-Brian and more than a few Irish fans declared themselves Wallaby fans ahead of Saturday. And no doubt they are serious. Personally, we would find it pretty hard to cheer against any representative team containing Jonny Sexton, Sean O’Brien and Tommy Bowe (unless they all signed for Saracens), but it’s a very understandable emotion. We’ve talked before about how many fans feel they don’t really have a stake in the Lions and how it’s tough to really buy into the team, so it’s quite obvious how disappointment can breed resentment. It’s easy to talk about getting behind the Lions and how there are no nationalities, just 15 Lions (though this is easier said when the team is full of your own national heroes! ), but deep down, it doesn’t really work that way for anyone. At the end of the day, folk have an affinity with the players they adore for their club/province and nation. There’s no instinctive reason to feel emotionally attached to a mainly Welsh team playing such reductive rugby – unless you’re Welsh, or really enjoy negative rugby. The great binding force of the Lions crest can only get one so far, particularly when it has become so wearisomely rammed down supporters’ throats by the Sky machine. While it’s difficult to completely disentangle one’s emotions after the whole BOD affair, it’s not so much the OUTRAGE over the dropping of Ireland’s national icon that is so deflating, but the message it sends out about the identity of this Lions touring squad. It’s a sad indictment of this Lions coaching team when the most skilful players – Brian O’Driscoll and Justin Tipuric – are passed over for bigger chaps who can bosh harder. Is this really the best the Lions can do? I thought this was the pinnacle of the game, or something. While we’ll be cheering for the Lions on Saturday, there is a goodly portion of our being that feel the best result for all concerned is an Australia win. This Lions squad simply doesn’t deserve to win the series (barring a sudden about-turn in performance and approach entirely out of keeping with the selection and the first two tests). Sky will tell you that ‘immortality’ beckons for the winners, but does it really? Immortality, for scraping out two wins (at least one of which was undeserved) against a misfiring Australia? In what has been a lamentably poor quality series thus far, the Aussies have been the better side in all facets of the game, have shown occasional invention, been brave (foolhardy?) in selection (three debutants and a rookie outhalf for Brisbane), have at least two bona fide geniuses in their team and, crucially, have played all the rugby on offer (such as it has been). They are far from a great team, and frequently go backwards in their attempts to attack, but at least they’ve tried to play with the ball. This Lions team and squad is supposed to be the best the Northern Hemisphere (well, the old public school English-speaking Northern Hemisphere) has to offer – and they haven’t covered their Hemipshere (go Northern Hemisphere!) in glory. They have bished, bashed, shunted, huffed, puffed and boshed (in the Tests) - which should have been expected, to be frank. The Lions are essentially composed of Leicester and Leinster players bolted onto the (Six Nations winning) Wales squad - and it’s been grim to watch. If the Lions do manage to win in Sydney, it will be a disaster for Northern Hemisphere rugby – a Neanderthal gameplan that prizes brawn over brain will have prevailed and will doubtless become orthodoxy all the way to RWC15. At least Ireland can rely on Joe Schmidt to buck the trend, but on the squidgy February pitches even he will be up against it. Where are the skills? Where is the daring? I’m sure we aren’t alone in thinking players don’t need to be from below the equator to be able to play an enterprising and watchable brand of rugby, while retaining enough forward power to get the Heeeeeeeeeeeeeeeeave going. Fancy the Lions Tour commemorative DVD under your Christmas tree? No thanks. But… Immortality! Ultimately, wouldn’t it be better to come home in a welter of hand-wringing, wondering why the best that four Nations has to offer couldn’t beat a Wallaby team that was begging, begging, to be beaten. There’s something unsettling about the thought of Gatland being vindicated having presided over such a dispiritingly awful series, and after his grandstanding in dropping Brian O’Driscoll. In Sydney, we’ll be hoping the Lions come out, and contrary to all the pre-match signifiers, give it a good lash, play some decent stuff, show well (all of them, not just the Irish), contribute to a great game of rugby and thrash the Aussies by four tries to one. But if they set their stall out to grind and bosh their way to a win, there will be a considerable dose of schadenfreude in Cordite Towers if they get what they deserve, which is to lose. Email “Opinion: It's understandable why some Irish fans aren't cheering for the Lions tomorrow*”. Feedback on “Opinion: It's understandable why some Irish fans aren't cheering for the Lions tomorrow*”.